Anyone who thinks “chivalry is dead” hasn’t been paying much attention to the news. Plenty of examples of chivalry made headlines in 2009. This isn’t the kind of chivalry that is demonstrated by opening a door or bringing flowers to a date, however … it’s real chivalry, the kind that involves the integrity to do the right thing, the confidence to make personal sacrifices for the benefit of others, and the fortitude to display dignity and honor, even under the most adverse conditions. If there was such a thing as the Chivalry Awards, perhaps the following would be this year’s winners. But chivalrous people don’t follow their ideals to get trophies or make speeches – they simply do what needs to be done, and set the examples that need to be set, in order to make the world a better place. 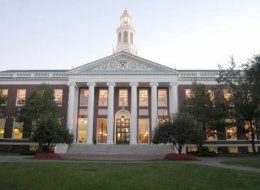 5) The Harvard MBA Oath — Having seen too many unsavory management practices, several members of the 2009 graduating class of the Harvard Business School felt the time had come to show there were still decent people in the business world. During the spring semester, class members put together a simple eight-point oath of ethics that could be applied in any sector in the world of business. The oath included statements such as, “I will manage my enterprise in good faith,” “I will understand and uphold, both in letter and in sprit, the laws and contracts governing my … enterprise,” and “I will be accountable to my peers.” Their goal was a modest one: To get just 100 members of their class to sign the oath. In the end, however, not 100, but 900 students put their names to the oath – over half of the graduating class. And as news of this movement spread, business students all over the world began to take up the cause. To date, the Harvard MBA Ethics Oath has been adopted (voluntarily) by hundreds of schools around the globe; more than 1,700 students have signed it so far, and the list continues to grow every day. It seems there are still men and women in the business world who want to be champions instead of sharks. Cardinals first baseman Albert Pujols was first on the scene to help an injured fan. 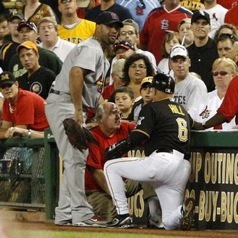 4) Albert Pujols Tends An Injured Fan — At a baseball game between the Pittsburgh Pirates and the St. Louis Cardinals on Aug. 7, a fan in the stands made an enthusiastic reach for a foul ball … and would up taking a literal nose dive over the wall and onto the field. The on-call EMTs rushed to take care of fellow, but paramedics and fans alike were surprised to see a white uniform at the injured fan’s side — that of number 5, Albert Pujols. The Cardinal’s first baseman stayed with the man for more than 10 minutes as the EMTs bandaged a severe laceration on his face, then reassured the man’s son that everything would be okay as they were taken to a nearby hospital. (The incident earned Pujols the AT&T Sportsmanship Award.) Although taking time away from an important game to tend to an injured spectator isn’t exactly “business as usual” for a top-ranking pro athlete, Pujols’ fans weren’t surprised by the incident — Pujols is known for using his off season to do charity and humanitarian work in the Dominican Republic where he grew up. This incident is just a reminder that a highly successful athlete (Pujols is a multiple All-Star and MVP recipient) can also be a knight in shining armor. 3) The U.S. President Takes A Bow — On Nov. 14, President Barak Obama raised some eyebrows when he lowered his head in a traditional bow as he was introduced to Emperor Akihito during a political visit to Japan. Politics aside, this gesture was an effective reminder of the simple principle of humility. As many commentators (from both sides of the political aisle) pointed out, bowing in this circumstance was not a sign of submission or deference, but simply a show of good manners. Even the most powerful man in the world should be gracious (and confident) enough to respect the customs of hospitality when he is visiting someone’s home. (In the 14th century, the King of England once considered it a great honor when, at a royal dinner, he personally knelt beside and served the visiting King of France – not as an act of submission, but as a display of the proper devotion of a host.) In the ideals of chivalry, power and authority should always be coupled with humbleness and sensitivity. 2) A New Moon Rises Over Chivalry – The motion picture New Moon opened on Nov. 20, and this second installment in the Twilight vampire saga based on the books of Stephanie Meyer had the a lot of critics and media analysts buzzing about an unfamiliar topic: chivalry. The cinematic merits of New Moon may be up for debate, but this movie has both pop culture pundits and American teenagers discussing the ideals and practices of chivalry with a sort of dignity and clarity that hasn’t been done in decades. In many ways, the supernatural characters of the Twilight saga resemble the iconic knights of Arthurian legend: Stronger and more powerful than average mortals, and struggling to restrain both their amorous and combative instincts because of the inspiration of love and honor. New Moon’s opening broke box office records all across the board – a fine demonstration that a powerful message of chivalry can still appeal to a broad audience. 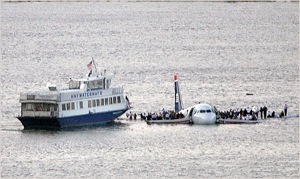 A ferry diverts course to help survivors of Flight 1549 as they wait calmly for rescue. 1) Flight 1549 Lands In The Hudson River – Americans were shocked to hear the news on Jan. 15 of a jet airliner that crashed in the Hudson River shortly after takeoff. They were equally stunned – and inspired – by the stories of the evacuation and rescue of the survivors. Passengers, crew and officers, led by Captain Chesley Sullengerber, acted and reacted with dignity, courage and compassion. Rescue personnel and bystanders alike rushed in to help with little thought to their own safety. President George Bush himself commended everyone involved and said, “the skill and heroism of the flight crew as well as the dedication and selflessness of the emergency responders and volunteers” was an inspiration to all. The incident was dubbed “The Miracle on the Hudson,” a reminder to everyone that the world is full of heroes, and that chivalry is alive and well. This blog entry is part of the Group Writing Project: 2009 In Review, sponsored by DailyBlogTips.